**Note: this post does NOT contain spoilers for any of SideQuests’ rooms. It focuses mainly on the experience and quality of the escape room and not the actual puzzles found therein. Well, Edmonton—in the space of two years, we went from one single escape room facility to an explosion of them throughout the city. Puzzle Fever is dominating. Of course, when the market becomes saturated with too many similar experiences, it’s up to the entrepreneurs to bring something new to the table. Escape Rooms like Smartypantz and Escape City introduce videos and actors, while Edmonton’s first escape room, Breakout, has recently opened a PvP room in which two groups can go head-to-head in a battle to see who can escape first. SideQuests, the city’s newest escape adventure, offers something a little different. Rather than offering the same puzzle direction for everyone, their rooms have multiple endings. Their tagline, “How will YOUR quest end?”, points to the changeable nature of their escape adventures—depending on what puzzles you choose to solve and what direction you choose to take, your quest could end very differently from someone else’s. We recently got the chance to try SideQuests’ first room, UNCLE, which is themed around the players’ eccentric Uncle Willard and his cryptic plea for help. The facility itself is located in the heart of downtown on 104 Street and 102 Avenue, beneath the Stage 104 restaurant (you have to go into the building and then head downstairs to find it). It has a clean, well-lit welcome area with plenty of games and mini puzzles to play while you wait, and several snacks available for purchase. The staff are friendly and helpful; all of them seemed very excited about the room and the experience they offer, which I take as a very good sign. It’s usually a good indicator of quality when the staff take pride in their service. My initial assumption wasn’t wrong. Our room adventure started in the waiting room with a nice little personalized surprise that brought us right into the story. (No spoilers! You’ll have to try the room to find out what it is.) Once we entered the actual escape room, we embarked on a mystery riddled with puzzles from scientific, paranormal, and conspiracy theory themes. The room, though small, was beautifully decorated. In this aspect, Edmonton escape rooms always seem to be getting better—the set quality at most of the newer facilities are much more lush and comprehensive than some of the city’s earlier rooms. Unlike other facilities that score people based on the time it takes them to break out, SideQuests scores on the group’s remaining time and the number of hints requested (but you do get an unlimited number). The room times are 45 minutes, which seems to be fairly standard throughout the city. The first room I ever did was at Breakout West. What I liked about that room was the linearity of the puzzles and the fact that the puzzles weren’t just about finding and entering a number code. In many rooms throughout the city, the sheer number of lock boxes and padlocks can become quite daunting. Even the last room we attempted at Smartypantz had a collection of boxes all waiting to be opened (at one point, there were a bunch of them sitting on the table—it makes it difficult to know where to start). SideQuests, however, takes a different approach. You won’t be inundated with lock boxes and you might have to exercise your snooping skills to find out exactly what you need. What I absolutely adored about this room—which, coincidentally, is one of the reasons we weren’t able to finish this with our group of three—is that you really have to use your brain. You aren’t just hunting for a series of numbers to open a lock, you’re being tested with logic puzzles. Be prepared to deal with patterns and abstract thinking. Get ready for logical analysis and a lot of “if this, then that.” If you’re into that sort of thing, then you’ll love the UNCLE room. One of the great things about SideQuests’ rooms is the replay value. Our room, for example, was huge (puzzle-wise). There was no way we could’ve finished it on the first try. I’d be surprised if there were many groups that could. The size, combined with the story’s multiple endings and the room’s clear attention to detail and story-building, means that a one-time experience in one of SideQuests’ rooms will never be enough. Since opening, many groups have returned to take on the same rooms—when you visit, you’ll see photographs documenting each attempt on the front wall in the lobby. SideQuests’ multiple ending rooms are a unique and exciting addition to the Edmonton escape room scene—I can’t imagine the amount of brainpower it takes to make sure all endings are possible and that puzzles don’t overlap. 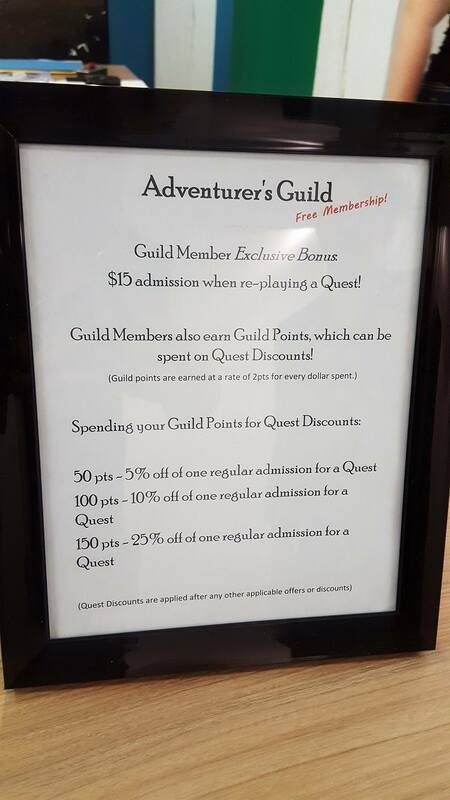 The team at SideQuests have brought a user-friendly experience for the escape room enthusiast because not only can you enjoy multiple visits to the same room (not something you’d really want to do at another facility), you can also join the SideQuests Adventurer’s Guild to earn points from each visit, which you can then trade in for a discounted admission fee. I strongly recommend giving SideQuests a try, but be warned—you’d better bring your A-game. These aren’t your everyday escape room puzzles. Thanks so much for stopping by! We’re glad you guys had fun and we’d love to have you come back for EXPEDITION! Pingback: Uncle Review Roundup – SideQuests Adventures Inc.
Pingback: Grand Opening! – SideQuests Adventures Inc.